Excerpted from Glen A. Beery, AS I REMEMBER (1996), used with permission of Delbert Beery. One of the first things I did after buying the orchard was to cut down and make firewood out of about 100 trees that during the time I rented I learned didn’t produce and/or were varieties that didn’t sell. Neher had set the west 7 ½ acres in 1912 and later about 1929, he set the east 7 ½ acres. Most of the trees that I cut out first were on the west side. It takes most trees 12-15 years to reach full production. With good care, a tree should last another 20 years. During the course of the next 45 years that I cared for the orchard, I replaced nearly all of the original trees. In the southwest corner of the farm was a one-room brick school house, Walters School, built in 1887. It was used as a sales room and storage for apples. The Nehers had dug a basement under all of the building in 1932, and it made an excellent storage. All of the apples were sold retail at the orchard. Producing apples is a pretty high risk business. Late spring freezes, long periods of rainy weather, plus all the diseases and insects that can attack the crop, are a constant worry during every growing season. Only twice in 45 years did I have a complete failure of the apple crop—in 1944 and 1961. In 1961, the trees bloomed and set on a full crop and had apples as big as your thumb. Then a hard freeze came on May 25 and wiped out every apple in the orchard. That was the latest a crop was damaged by a late freeze. Over the course of the years, we had varying degrees of loss from late spring freezes, from 10% to 60%. In years when the crop was less than normal, we would buy apples from Michigan and other orchards in the area. Cider was a big drawing card when selling direct from the orchard. We had to take our apples to a cider mill to get cider made. Over the years, we went to cider mills as far away as Rochester (24 miles), Athens (18 miles), Columbia City (25 miles), and Huntington (18 miles). In 1978, we bought our own cider press and saved a lot of man-hours from running to the mills. On the plus side, we could make cider often enough for it to always be fresh and sweet. We had one customer every fall who would order 52 ½ gallons to freeze so he could have a ½ gallon of fresh cider every week of the year. We had the reputation of having the best cider in the area. Lots of stories are told about both sweet and hard cider. A lady customer said she would like to buy a jug of cider if she was sure there were no worms in it. I told her she didn’t have to worry about the worms in the cider because the cider press had a worm extractor on it. She bought some cider. Fresh, sweet cider for most people is a very good natural laxative. Hard cider or ‘apple jack’, if mode properly, is a very deceiving drink because it has a smooth taste and looks much like sweet cider. In the ‘good old days’, nearly all farms had a small orchard of 10-12 apple trees and a pear tree. You were not ready for winter and the next year’s canning season unless you put a barrel of cider in the cellar to ferment and produce vinegar to use in canning the harvest from the garden. …One of the more noticeable changes in the 45 years of selling apples direct from the orchard was the public’s buying habits. In the 40s and 50s, it was not unusual for a family to come to the orchard about the same time we had finished picking and buy four or five bushels to take home for the winter. By the 80s, we were selling more apples by the peck and ½ peck than any other way. I think several things contributed to the change. More and more houses were centrally heated and had no good place to store apples. The younger families thought of apples just as an eat-out-of-hand fruit and never thought of making apple sauce, baking apples, making an apple pie, apple butter or apple salad. Most people today don’t realize that the apple is the most versatile fruit you can buy. One hundred years old this month, the red brick one-room school house now serving as the storage and sales facility for Beery's Orchard is a living monument to the progress of time. That's the feeling of Maurine Beery who knows a thing or two about the evolution of school houses in Indiana, having taught for 31 years in the area schools, including Servia and Liberty Mills where the old abandoned school houses still stand. "We need to preserve our history, to talk about how it was then, so that our children and their children can understand how things were done before we had modern schools," she felt. Active in the local historical society, Beery noted, "So many things are getting away from us that our children will never experience." 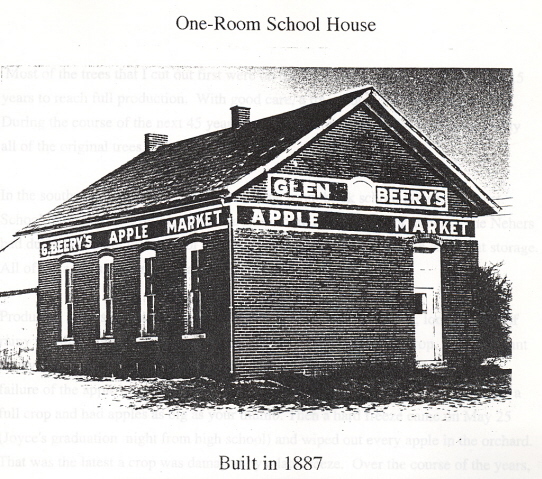 The Beerys' school house known as the Walters School, is a well-preserved example of how schools were built and how they looked in the year 1887. Of triple brick construction, the building still has its original slate roof. The wooden floors are two layers thick, with one by twos stuffed with mortar underneath to deaden the sound of many little feet, reported Glen Beery. "At one time there was a school like this every two miles, the theory being then that a child would never have to walk more than a mile to school," reported Glen. "Course nowdays if a kid goes more than one or two blocks it's practically a sin," remarked the former school trustee. Beery said that legend has it the Walters school was built by a man who could neither read nor write. "It's said he came out here every day at noon to drive stakes by the sun's shadow so he could make the building square with the world," he said. "Look at it for yourself--every line is straight," he added. The school was heated, of course, with a potbellied stove. But what is unique is that the stove drew in cold air from the outside, with special vents at all four corners of the building, and then heated that cold air as it passed up and around the stove. The building served its purpose for just 20 years, before it was decided to send the kids to town. After that it became a home for a Johnston family, who lowered the ceilings, built partitions, added another chimney and stove, and dug a basement, now just perfect for apple storage. The history of the orchard itself dates to 1912 when Simon P. Neher, using dynamite to dig the holes, planted seven and one-half acres of apple and peach trees. 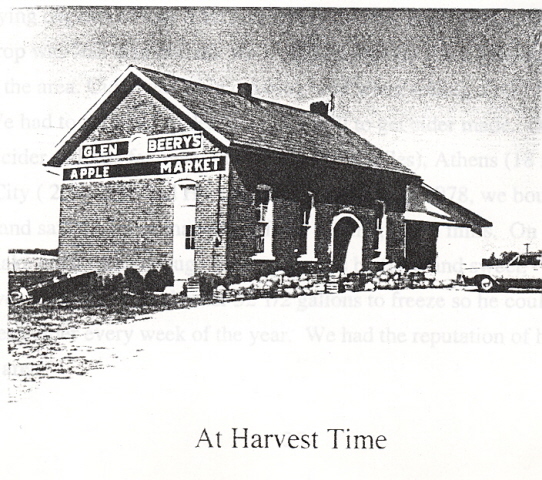 The first major apple crop came in 1925, and the Nehers celebrated by buying a new Nash auto. 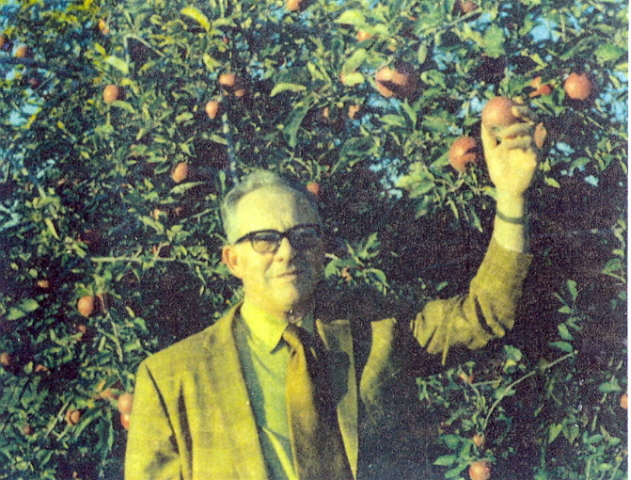 In 1943 Neher retired and leased the farm to the Beerys, who purchased the orchard in 1953. They still produce apples and cider, with the help of their son, Delbert. The following photographs are from Glen A. Beery, AS I REMEMBER--THE STORY OF MY LIFE (1996). Posted here with permission of Delbert Beery.